Human Concern International (the first Muslim Charity in Canada) held an in event in Surrey to raise funds for the children left orphaned in the Myanmar/Burma genocide. Imam Khalid Latif, a renowned Chaplin from New York and Princeton University, partnered with Human Concern International (HCI) for this important cause for a 3 stop tour in Western Canada – Surrey, Edmonton and Lac La Biche. Imam Latif shared his experience, of visiting the refugee camp in Bangladesh, with powerful imagery and stories of the daily struggle for families. His message centered on the sheer enormity of over 700000 people living in a makeshift mega-camp. Imam Latif also highlighted real human stories of individuals whose lives have been changed forever just by being considered as ‘the other’ by the majority in their homeland. It was hard to watch for sure because none of the Muslims were spared; old, young, men and women all were forced run for their lives and much worse. Local community activists and speakers included Haroon Khan who MC’d the event, Yasmin Ullah a Rohingya herself with a heart rendering poem, Aysha Khan with a message for women and youth, and Shawkat Hasan (Vice President of the BCMA), amongst others. Habeeb Ali is part of the HCI team in Toronto and organised the tour, travelling with Imam Latif. 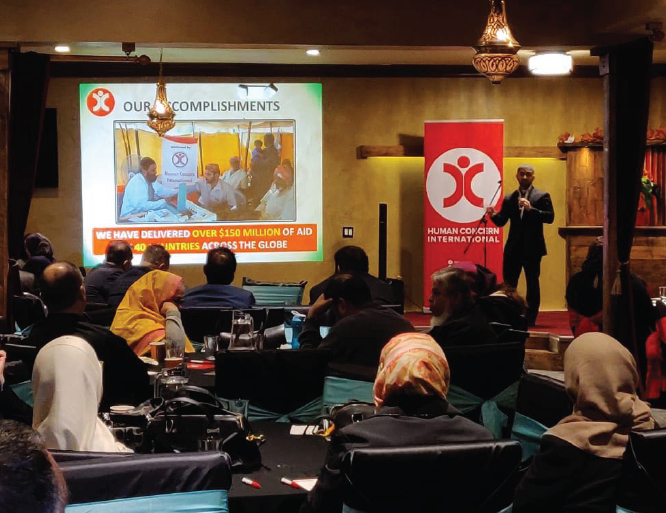 The fundraiser in Surrey was organised by local community members Haroon Khan (PCA), Yousaf Barakat (Arab Forum), Furquan Gehlen (Canadian Peace Initiative) and BC HCI Board member Ishtiaq Salim. The Sunday October 21 brunch was held in the Village barbeque restaurant, which recently opened and has a large hall capable of holding 200 people. All guests enjoyed Karachi style brunch at the start of the event. Community members, local Muslim organizations and businesses raised over $45,000. HCI child sponsorship program costs $30 per month for each child. Total donations from the tour amounted to about $120K will help over 300 children for a year. Some sponsorship from the community was continuous.